The U.S. working class was slow to respond to the hard times it faced during and after the Great Recession. Finally, however, in February 2011, workers in Wisconsin began the famous uprising that electrified the country, revolting in large numbers against Governor Scott Walker’s efforts to destroy the state’s public employee labor unions. A few months later, the Occupy Wall Street movement spread from New York City to the rest of the nation and the world. 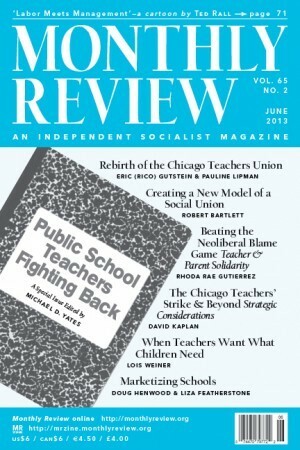 Then, in September 2012, Chicago’s public school teachers struck, in defiance of Mayor Rahm Emanuel’s attempt to destroy the teachers’ union and put the city’s schools firmly on the path of neoliberal austerity and privatization. One thing that these three rebellions had in common is the growing awareness that economic and political power in the United States is firmly in the hands of a tiny minority of fantastically wealthy individuals whose avarice knows no bounds. These titans of finance want to eviscerate working men and women, making them as insecure as possible and totally dependent on the dog-eat-dog logic of the marketplace, while at the same time converting any and all aspects of life into opportunities for capital accumulation. The public sector is still, despite the effort of capital to dismantle it wherever it is not subservient to the plutocracy, the one sanctuary people have against the depredations of the 1 percent. Through struggle, working men and women have succeeded in winning a modicum of health care and retirement security, as well as some guarantee that their children will be educated, all irrespective of the ability to pay for these essential services. They have also found decent employment opportunities in government, especially women and minorities. The public sector, then, is a partial barrier to the expansion of capital in that it both denies large sums of money to capitalists (social security funds, for example) and protects the workers in it from the vagaries of the labor market. It is thus not surprising that capital has gone on the offensive against government provision of whatever is beneficial to the working class. A major war is now being waged by capital and its political allies against our public schools, especially those that serve poor and minority communities. Billionaires like Bill Gates and the Walton family have established organizations and contributed enormous sums of money to do two things. First, they seek to revolutionize the way in which students are taught. Here they have achieved great success, with two presidents enacting sweeping laws: No Child Left Behind and Race to the Top. Both condition federal aid to schools upon what has been described as “teaching to the test.” Literature, art, music, and all critical education are to be sacrificed so that children do well on standardized tests. Then, how schools and their teachers fare, including whether or not a school continues to exist, depends on students’ test scores. Second, these plutocrat “reformers” want to alter radically the way in which schools are organized. The best way to describe their aim is to say that they want public schools to resemble assembly lines, with students as outputs and teachers as assembly-line-like mechanisms who do not think or instill in their students the capacity to conceptualize critically and become active participants in a democratic society. And this Taylorization of schooling has a military-like component, with pupils expected to react to commands with rote discipline and respond unthinkingly like dogs to rewards for appropriate behavior. (See the astonishing article “The Silent Treatment: A Day in the Life of a Student in ‘No Excuses’ Land,” in the excellent EduShyster blog, about a proposed charter school in the impoverished working-class town of Fall River, Massachusetts.) Needless to say, the achievement of these horrible goals is most likely to occur if the schools are privatized and the unions destroyed. If those who are prosecuting this war against the schools succeed, they will have made workers more insecure, generated a compliant, alienated, and low-wage labor force, and created new ways to make money—a massive testing industry, for-profit schools, and consulting services. They will also have put another nail in the coffin of democracy. We should note that capital has already accomplished a great deal. Testing is now the norm, charter schools abound, and the mass media have joined the crusade against public school teachers. A reporter for the New York Times, for example, found it “curious” that in states where teachers themselves must be evaluated for competence, almost all teachers passed the test. She did not seem aware of her bias, that she simply accepted as fact that many teachers were incompetent, just as the “reformers” have been telling us (“Curious Grade for Teachers: Nearly All Pass”). 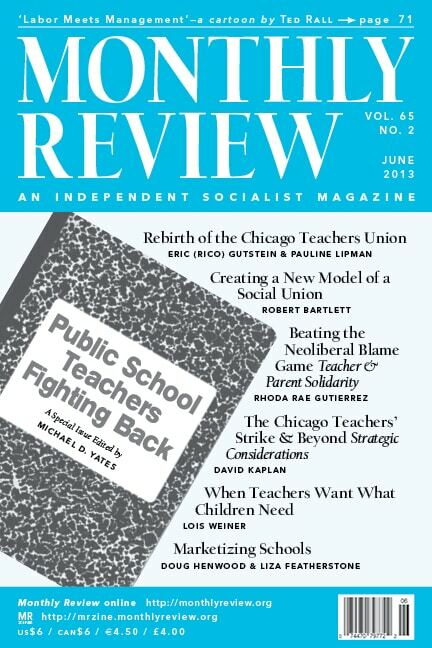 In this special issue of Monthly Review, teachers, activists, and scholars examine, largely through the lens of the strike last year by the Chicago Teachers Union (CTU), the war on teachers, their unions, their students, and their schools. In these essays, our writers give a vivid account of how the militant reform group, the Caucus of Rank and File Educators (CORE), won leadership of the CTU, how CORE forged strong bonds with poor communities to resist school closings and austerity measures, how Chicago’s financial and political leaders have been waging war against public schools and the teachers’ union, how the strike was built and ultimately won, and the lessons of the strike for teachers not just in Chicago but across the United States. Finally, our authors show how little benefit we have seen from all the testing, school closings, and privatization. The United States exhibits education outcomes worse than almost any other rich nation. Perhaps what this tells us is that the war on public education has motives other than ensuring that our kids “race to the top.” Perhaps creating a docile workforce and generating new profit opportunities are the real aims of the billionaire “reformers” and their political lackeys. This was in fact the conclusion of our July-August 2011 special issue, “Education Under Fire: The U.S. Corporate Attack on Students, Teachers, and Schools,” edited by William Ayres and Rick Ayres. The fact that MR has chosen to publish two special issues in just three years on the struggle for K–12 education (as well as publishing through Monthly Review Press Henry A. Giroux’s new book America’s Education Deficit and the War on Youth) shows just how important we think this struggle is today. This special issue only addresses the struggles of teachers, parents, and their communities on behalf of public schools in the United States. But we are well aware that this is a world struggle and that similar, even more serious, battles are occurring elsewhere today in Canada, Mexico, Chile, Brazil, France, and many other countries around the globe. In the future MR plans to look at capitalism’s international war on education as well as global developments in socialist education. In that context we would see the emergence of international co-operation among organized teachers as a very good sign indeed. Correction: In John Bellamy Foster, “Marx, Kalecki, and Socialist Strategy,” in the April 2013 issue of MR, page 3, paragraph 2, lines 9-10 should read: “‘full employment profit squeeze’….” The inner quotation marks were inadvertently left out.